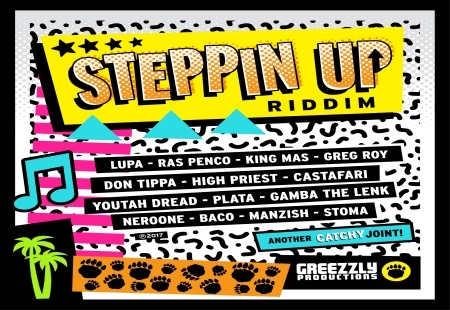 "GREEZZLY PRODUCTION PRESENTS "STEPPIN UP RIDDIM"
After a string of highly apreciated roots releases italian reggae label Greezzly is back on the market with a brand new dancehall selection featuring artist from Jamaica, Africa, Usa and Europe. The riddim, taking his title from Lupa's opening tune, delivers a fresh-sounding summer-ready vibe over a tough 90's dancehall riddim back bone. All vocals shows plenty talent and inspiration. L'etichetta reggae italiana Greezzly, torna con un nuovo riddim dalle sonorità’ dancehall: "Steppin up”. La tracklist è composta da ben 14 brani più la version e vede la partecipazione di grandi artisti provenienti da Giamaica, Africa, Usa e Europa. Steppin up offre un atmosfera d’estate, fresca ed allegra. Disponibile su iTunes.